Quito Every country is different, every city is different, and every community is different. We start from there, and then we adapt what we have seen work in so many places and modify it to fit the circumstances and objectives of our organizing program. No matter how many times I have done this, it still seems like a glorious miracle when we re-engineer the model, gas it up, put it on the streets, and once again see it work, which is exactly what I have been doing with Marcos Gomez from ACORN Canada over the last week. 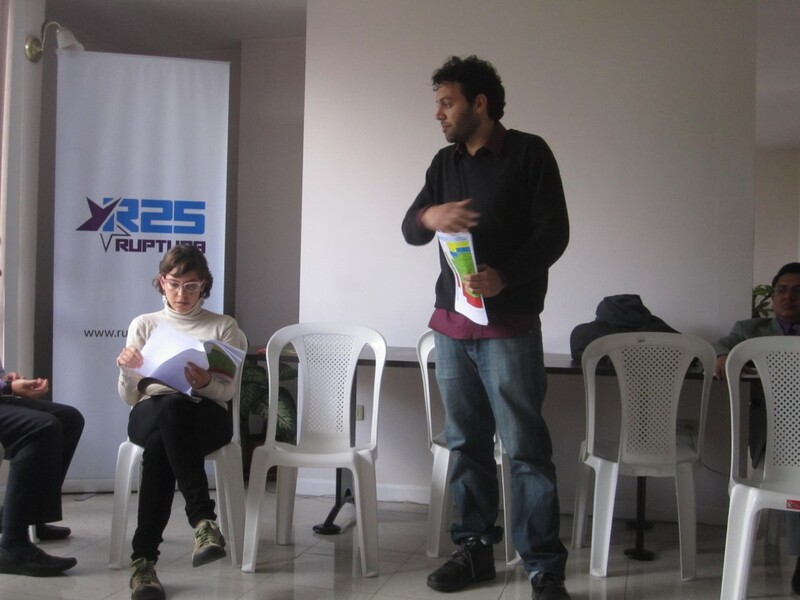 In collaboration with Ruptura 25, we have fashioned the ACORN program we call “puerta a puerta y calle” – the “door-to-door and street” program for building contacts and commitments of support throughout the community. Yesterday we put the organizers who are going to be our potential field managers in Carcelen, an area that our friends thought might be hostile. Even on their rookie trip, the organizers did very well, so we’re on our way! “Count-on-me’s” or “Cuenta Conmigo!” as we call them were signed by 10% of the visits almost. Another 10% agreed to host house meetings (reunions en casa), and we had 25% of the visits rank as #1’s which is too high, but they will get more accurate as we go along. It’s exhilarating! In Quito “seguridad” or safety is a constant concern. We have to navigate the visits through gates, bells, windows, and iron doors. Multi-story buildings lead us to the house meeting program to build our organizing committees in buildings, much as we learned to do in Buenos Aires and Toronto. We are pulling the organizers off the streets at 6PM as darkness closes in, so the schedule involves training, then street work among business and high traffic areas in the neighborhood to accelerate contacts on our 10-week timeline, and then four (4) hours puerta a puerta followed by the debriefing. Some things change, but some things stay the same. We may be posting the daily results on butcher paper with all the organizers names in our “territorio oficina,” as they call it here, but we’re also posting the daily totals on Google Drive, so other folks can see the results in a timely fashion. We text back and forth to determine locations on the streets, which in much of our areas are letters and numbers (C-45 for example), rather than having names, particularly where the barrios began as informal squatting settlements. 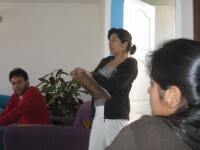 Today we put out twenty (20) organizers to start the program, ready-or-not, in earnest in Quito Norte. We made plans for expanding to Guayaquil yesterday. Plans are moving for next week in Santo Domingo, the 4th largest city. A trip to Manabi on the coast, will open another front. 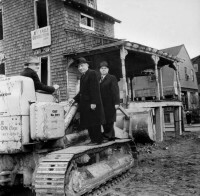 Robert Moses, seated at left in 1959, used his position as head of the Mayor's Committee on Slum Clearance to mass-produce thousands of units of public housing, often near the shoreline. Quito One of the ironic outcomes of recent disasters, whether New Orleans or now New York, is that the public, policy makers, and politicians are finally forced to reckon with where the poor are, and often, where they have put the poor in ways that are hard to escape. In a smaller way this is true of politics and elections as well, as we have recently seen in the sudden realization of the Republican Party that there are a whole, whopping lot of people out in America that don’t look or think like them. Like disasters, democracy is an equally transforming experience, as I am also seeing daily in Quito and throughout Ecuador, as new and old parties try to calculate their appeal and power in places they do not know and with people they do not completely recognize because they are foreign to their daily experience. In New Orleans ignoring the failure of public protection and the levee system, many areas that flooded were in places like the 9th Ward where land had at one time been cheap enough to allow African-American families to buy and build or where swamps had been filled sufficiently to allow developers to create cheaper land for housing expansion as the city grew. In Quito or Mexico City or Lima, poorer and lower waged workers, immigrants, or migrants moved to where there was land, squatted, and tried to make the best of it, until cities were slowly forced to deal with the burgeoning populations and politicians were forced to figure ways to deliver to leverage their support. In New York an interesting piece today in the Times, “How the Coastline Became a Place to Put the Poor,” by Jonathan Mahler, looks at the role of legendary power broker and public developer, Robert Moses. In fairness of a sort, Mahler even concedes that maybe some of these re-locations might have not just been based on cheap land and eminent domain, but even “good intentions,” citing the efforts of Mayor Fiorello LaGuardia to clean up the slums on New York’s Lower East Side, pushing new housing towards the waterfront, which also flooded in the wake of Hurricane Sandy. What interests me is not that plans go awry over time, that good intentions can create their own hells, or that concentrated high rises for the poor, the old, the infirm, and the challenged can re-ghettoize areas into new wastelands “…without reference to health, sanitation, safety and decent living” in the earlier words of Robert Moses, but the inability of governments, politicians, and the public to abandon their nostalgic notions of what they had hoped might be developed when they pushed the poor out of sight and fully meet the challenge of resolving the handiwork of earlier decisions and their consequences. Without a doubt, cheap land is going to attract poorer families and poorly funded public works. This is simply reality, regardless of the intentions, so let’s get past that. The real problem is that whether governments push people there as in New York City or turn their heads and finally find them there in New Orleans, Quito, Lima, Mexico City, and thousands of other cities, small and large, ignorance of the government is not bliss, and the challenges created by reality have to be faced. For want of a better way to say this, if housing is going to be separate, at least citizens and families have to be assured that it is equal. Services have to be provided. Transportation has to be affordable and accessible. Jobs and work locations have to have incentives to move nearby. Decent retail outlets have to be located in accessible areas and subsidized if necessary to ensure success. Public schools, police, fire, health clinics and hospitals have to be built, supported, and guaranteed to perform at the same or better quality as provided anywhere else in the government’s jurisdiction. The social contract between government and citizens cannot guarantee that there will never be mistakes or that perfection is possible, but has to warrant that every effort will be made to create equity and in simpler terms, to fix whatever is broken. Ironically, doing so not only provides more citizen wealth, city stability and security, but on the long run saves money as countless studies have established. Democracy encourages us to not avoid the messes we create and the problems around us because it allows people to have a voice and creates occasions where these voices cannot be ignored or silenced. Disasters by definition are terrible and force us to stop ignoring the precarious problems we have created and reckon with the largeness of our “community” in terms of morality and human rights, easily swept aside in the hurry of everyday lives, but now no longer invisible, and recommit to the minimum standards that must be equitably guaranteed to all. Land use is a public decision and commitment, not a matter of fate and possible fatality.